January 31st. Mark your calendars. 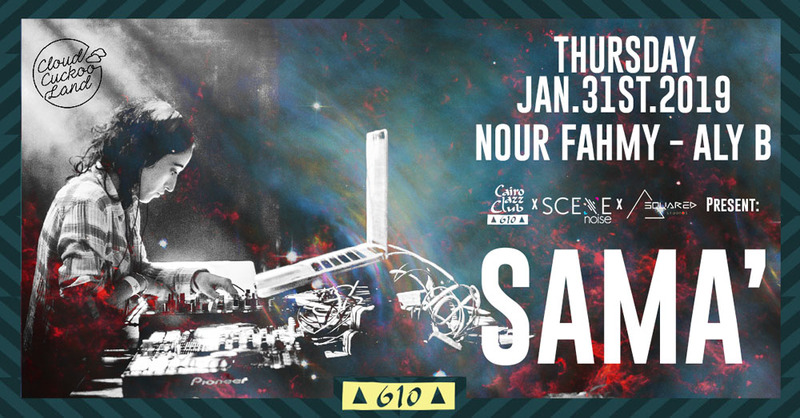 In collaboration with Cairo Jazz Club 610 and A-Squared Studios, we’re glad to announce that we’ve invited Palestinian artist Sama Abdulhadi AKA SAMA’ (previously Skywalker) to perform at CJC 610 on Thursday, January 31st. The main aim of this collaboration will be to bring the biggest, most exciting and most revered talents in regional dance music to Egypt. SAMA’ has been credited with the incredible achievement of being the first to bring techno music to Ramallah and the West Bank. She started DJing in 2006 and was producing her own tracks by 2010, with her career skyrocketing shortly after. Since then she landed performances at Berlin’s Fusion Festival, Glasgow’s Riverside Festival, clubs around the Middle East and Europe and most importantly at the first Boiler Room party in Palestine, in addition to appearing in their documentary “Palestine Underground”. On the 31st SAMA’ will take to the decks at CJC 610 alongside established local names Aly B and Nourre Fahmy, marking her Egyptian debut and we'll be live streaming her set on SceneNoise Facebook from 1 AM. For more info and reservations head to CJC 610’s Facebook event page. Follow SAMA’ on Facebook and Soundcloud.